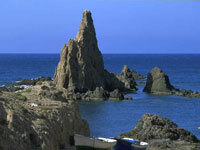 The Spanish province of Almeria is made up of about 200 miles (322km) of varied, scenic coastline that attracts package tourists to its developed resorts near the main towns, but also offers idyllic spots for nature-lovers to explore unspoilt fishing villages, long, sandy beaches and small, intimate coves which are popular with nudists. Enjoying a sunny and mild climate, Almeria lies southeast of the Iberian Peninsula on the Mediterranean Sea, and still bears the archaeological evidence of many ancient cultures, from the Tartessos and Phoenicians, to the Romans and Visigoths, who were drawn here by the natural beauty, and useful maritime geographic location. The region retains an African flavour owing to its proximity to the continent. Inland, Almeria is rather barren, and boasts Europe's only desert region around the village of Tabernas, which has been used as the location for several western movies. In the east, the lunar-landscaped Cabo de Gata-Nijar nature reserve, with its rugged coastline, attracts hikers, birders, and scuba divers. Despite the dry, inhospitable landscape, Almeria has developed a thriving agricultural industry, and plastic-covered tunnel farms, packed with fresh produce and flowers are prolific. Most visitors flock to the holiday resorts to the east and west of the lively capital city of Almeria, which boasts picturesque squares, some worthy sights to see, cafes, a ferry port, and marina. Lovely beaches, marinas, hotels, and sport centres provide plenty to keep holidaymakers happy in the resort towns of Mojacar to the east, and Aguadulce, Roquetas de Mar, and Almerimar to the west of the city.